I LOVE Coke. I often use Caffeine so that I can stay up later, have more energy and get more stuff done. However, I know Soda is Bad for me. Recent stress and workload had me at an all time high for Coke consumption. Not to mention I’ve begun to pack on the pounds. So I decided to give up Soda for Lent. I had never given up anything for lent before. But I am proud to say I managed to resist all temptations for Soda during Lent. I did learn that Sunday’s don’t count in the 40 days of Lent, so you can actually have the item you gave up for Lent on Sunday, but again, I am proud to say I didn’t even do that. I did substitute with a few Sweet Teas, although I have tried to resist those as much as possible. And I’ve also drank pure and flavored carbonated water, or Perrier water mixed with a little bit of fruit juice. I also learned that Ocean Spray’s Cran-Cherry + Perrier is fairly close to a Dr. Pepper! Easter has come and gone, and Lent has passed. I actually feel better not drinking Coke and have lost about 5 lbs. I’ve had only one Coke since Easter. I enjoyed it, although I didn’t go overboard with it. (Just one 12 oz cup and didn’t refill my glass). For those who watch what they eat and drink, this is really an eye-opener. We all know that water is important, but we’ve never seen it written down like this before. 75 percent of Americans are chronically dehydrated. In 37 percent of Americans, the thirst mechanism is so weak that it is often mistaken for hunger. One glass of water will shut down midnight hunger pangs for almost 100 percent of the dieters studied in a University of Washington study. Lack of water is the Number 1 trigger of daytime fatigue. Preliminary research indicates that 8-10 glasses of water a day could significantly ease back and joint pain for up to 80 percent of sufferers. A mere 2 percent drop in body water can trigger fuzzy short-term memory, trouble with basic math, and difficulty focusing on a computer screen or on a printed page. Drinking 5 glasses of water daily decreases the risk of colon cancer by 45 percent, it can slash the risk of breast cancer by 79 percent, and one is 50 percent less likely to develop bladder cancer. In many states in the USA, highway patrol cars carry two gallons of Coke in the trunk to remove blood from the highway after a car accident. To clean a toilet: Pour a can of Coca-Cola into the toilet bowl and let the “Real Thing” sit for one hour, then flush it clean. The citric acid in Coke removes stains from vitreous china. To remove rust spots from chrome car bumpers: Rub the bumper with a rumpled-up piece of aluminum foil that has been dipped in Coke. To clean corrosion from car battery terminals: Pour a can of Coke over the terminals to bubble away the corrosion. To loosen a rusted bolt: Applying a cloth soaked in Coke to the rusted bolt for several minutes. To bake a moist ham: Empty a can of Coke into the baking pan, wrap the ham in aluminum foil, and bake. Thirty minutes before the ham is finished, remove the foil, allowing the drippings to mix with the Coke for a sumptuous brown gravy. To remove grease from clothes: Empty a can of Coke into a load of greasy clothes, add detergent, and run it through a regular cycle. The Coke will help loosen grease stains. Coke will clean road haze from your windshield. The active ingredient in Coke is phosphoric acid, which has a pH of 2.8. Phosphoric acid will dissolve a nail in about 4 days. It also leaches calcium from bones and is a major contributor to the rising increase in osteoporosis. To carry Coca-Cola syrup (the concentrate), a commercial trucker must use the hazardous material cards reserved for highly corrosive materials. For about 20 years, the distributors of Coke have been using it to clean the engines of their trucks. 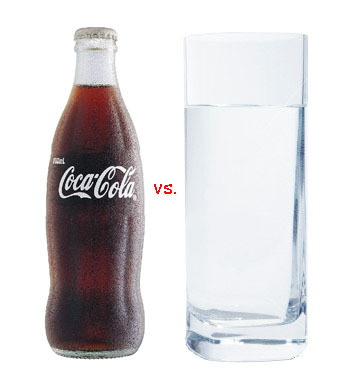 Now the question is, would you rather have a Coke or a glass of water?